At the 73rd Session of the United Nations General Assembly on September 25, President Maithripala Sirisena will announce a set of new proposals for consideration at the March 2019 session of the United Nations Human Rights Council (UNHCR). He will also submit these proposals to the United Nations Secretary General António Guterres as well as UN High Commissioner for Human Rights, Michelle Bachelet. The President expects to meet both of them during his visit to New York in two weeks time. Addressing the media heads, newspaper editors and heads of electronic media institutions at the President’s House in Colombo today (Sept 14), the President said that the proposals are aimed at solving issues and provide relief without causing harm to the pride of the security forces and safeguard independence, sovereignty and national security. Furthermore these proposals would facilitate harmonious solutions to remaining issues with regard to the alleged acts of both sides during the conflict, he said. The President is expected to lead Sri Lanka’s delegation to the 73rd United Nations General Assembly (UNGA) in New York, which begins September 18. The President will address the 73rd Session of the High-Level General Debate of the UN General Assembly at the UN headquarters in New York on September 25. The President said that although a section of the media level baseless allegations that the government was placing national security in danger by reducing the military strength, the government has taken every possible step to ensure national security. He pointed out the biggest budget allocation of Rs 230 billion is for defence and the forces have been provided with every requirement from modern weapons to aircraft and ships. Conceding that there are some shortfalls in the investigations conducted since 2015 on attacks of journalists and other civilians, abductions and killings, he said although several persons were detained in this connection, not a single person has been charge-sheeted or prosecuted. Although military officers have been detained and placed under remand custody, there were no cases filed and such actions merely bring bad reputation to the government, he pointed out. The President said that he had given instructions in a stern manner to the officials of the Criminal Investigation Department (IGP) and the IGP in this regard. Expressing his views further, the President said that under the administration of the present government the national security of the country has not weakened at any rate. The President pointed out that even though a restructuring process was executed, it does not mean this process weaken the strength of the security forces. He said the course of maintaining a security force in a country where there is no war was different from peace times. At present our security forces receive the cooperation as well as training opportunities in powerful nations of the world than the previous era. He also said that even today the highest allocation of the budget is made to the Ministry of Defence. 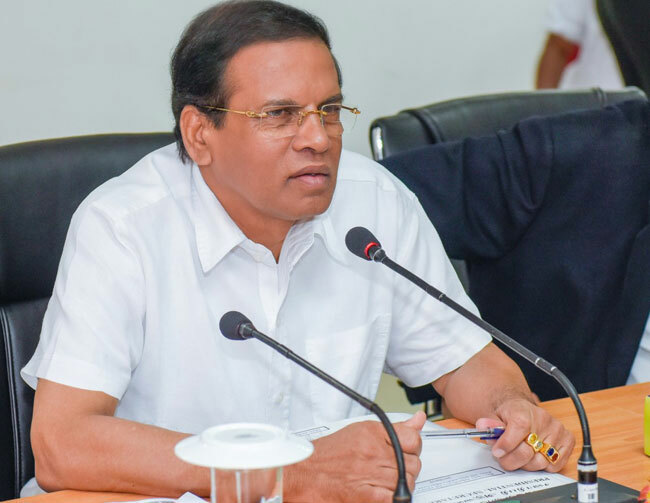 President Sirisena, when asked about the recent protest carried out in the Mullaitivu district that Sinhala people were being settled in the North, said that the policy is that every community holds the right to live in whatever part in the country. The expectation in a country is that every one lives in reconciliation and harmony without regional barriers and the government has not got involved in any housing settlement programmes that could create controversies and will not do such things in the future said, the President said denying the accusations leveled against the government.